Barbs are a schooling fish that add movement and color to your aquarium. They come from Southeast Asia, India, and Africa. Provide lots of swimming room to enjoy these little guys to their fullest potential. These are a hardy fish capable of living in a wide range of conditions. It is important to remember that good water quality and consistent temperature range over time will keep your barbs in better health. These fast swimming school fish do best in groups of six or more. A "safety in numbers" strategy serves to keep barbs calm. Solitary or paired barbs of many varieties become aggressive "fin nippers". As a group, they should not be in aquariums with long finned fish, such as bettas and angelfish. Aggressive, larger fish will tend to be drawn to the quick movements of barbs. Cichlids, who are sight hunters, will chase and harrass them. If large enough, an aggressive fish can eat barbs. They should not be kept with more aggressive fish. Your barbs will love planted aquariums, especially if the plants are tall or float. They like to hide and swim in among the plants and do not care for strong light. Strong light will make them timid and affect their color. An aquarium with lots of swimming room will be needed for your school of brightly colored friends. They are mostly lateral swimmers and like to dart back and forth, doing laps across your fish tank. 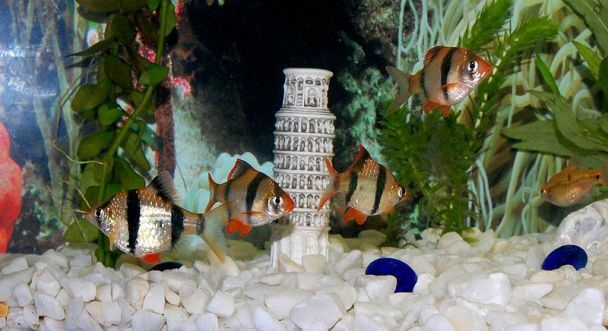 Give your barb some buddies and you will have many happy fish swimming around your aquarium. Below are some common barbs. Check their profiles to learn more about making some new aquatic friends. These are beautiful school fish, but you will need at least six. This busy school fish is a flashy bit of color for your aquarium. Active little swimmers, these fish school and add movement to your aquarium. This hardy fish is flashy in schools, but beware of fin nipping. you may think. Definitely look at its profile. For more information, go to Wikipedia's Barbs page. Do You Have A Favorite Barb? We all have a favorite fish. Somewhere in your aquarium you have a fish that you are proud of. If you have a favorite friend that is a Barb, take a picture and share a story about it with us.